Whether it is IT or Business in a corporation, a consulting company, a hi-tech product company, a legal firm, a marketing/ advertising agency, an HR department or any other type of organization, it has the need to manage portfolios. Portfolios are related groups of initiatives or activities or projects that need to be monitored together for an overall picture of how that group is performing as a whole. Depending on your function or business, you might want to manage projects, customers, lines-of-business, territory-based campaigns, recruitment campaigns as portfolios, make decisions and take appropriate actions to ensure the overall “health” of the portfolio. 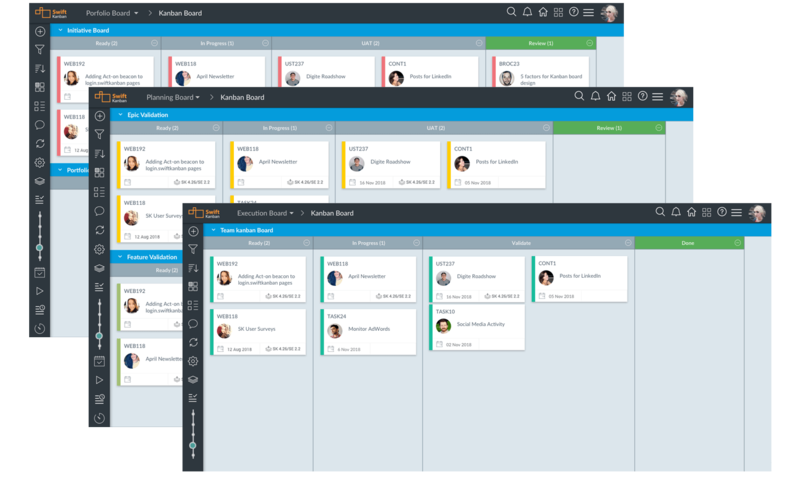 While traditional (Project) Portfolio Management tools abound, Kanban has the promise of being one of the easiest, yet very effective visual portfolio management tools. Portfolio Kanban is the application of Kanban to Portfolio Management. Kanban has several key features that makes it a powerful Portfolio Management tool. Applicability at any Level: Kanban’s beauty is its applicability to any workflow or value stream at any level of an organization or a work/ process hierarchy. Kanban can be applied to high-level Strategic processes, mid-level Tactical process and of course Team level Operational processes. So, while most organizations start at the Team level, it is perfectly possible to start at the highest level of an organization to track critical business initiatives’ approval and execution cycle, or a mid-level program-management and review process. As Klaus Leopold explained very nicely in this webinar, once a team feels the need for it, it can take any stage of their Kanban workflow – and decompose it into a lower level of Kanban board. 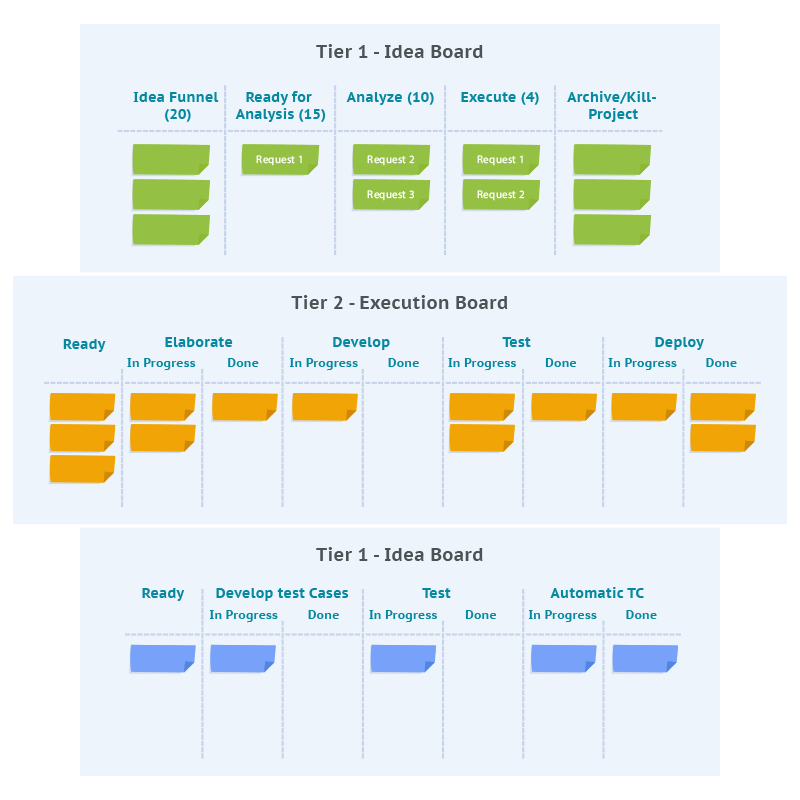 Decomposability of any stage of Workflow: To illustrate the point above, for example, the “Execution” column of a Portfolio Initiatives board that shows initiatives or projects under execution can be expanded into an “Execution Board” which shows a more detailed breakdown of the Execution stage. In the case of a software project, this might mean a typical Discovery – Design – Development – Testing – Deployment workflow. Here as well, the Development stage of this board can be further broken down into sub-stages. Aggregation/ Rollup of Progress Information: Portfolios are collections of “initiatives” – each initiative comprising a number of lower level work items and tasks that must be done to complete each initiative. The collective status of those work-items or tasks represents the status of the higher-level projects or portfolio initiatives. There may also be a dependency between work items and tasks of one initiative to one or more of similar items in one or more other projects or initiatives. Irrespective of how you choose to model portfolios, projects, and work items, Kanban provides you several tools – boards, horizontal and vertical lanes, cards and tasks to model these in a way that makes most sense to you – and be able to rollup information in the manner that most makes sense to your organization’s or the portfolio’s business objectives! Portfolio Visualization: The fundamental purpose of Portfolio Management is to understand the status of the projects or activities in a portfolio at any level and to understand the overall status at the highest level. 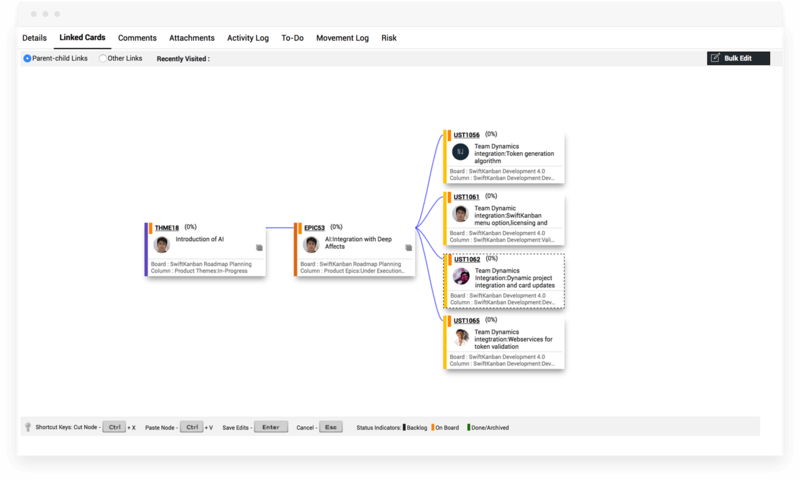 Kanban’s visual nature makes it very easy and intuitive to model and view Kanban boards at different levels – and get the status of initiatives, projects and the task at a glance! Given the flexibility of modeling Kanban boards, especially for ‘upstream’ and downstream work stages, it is also easy to visualize what the pipeline of incoming projects (the demand) might be – in order to make informed decisions on funding and other outcomes. The Kanban value stream is the most visual tool for modeling the “funnel” through which the projects flow. Swim-Lanes to segregate and depict one or more portfolios levels: You can use a single Kanban board or multiple boards to model a portfolio. In a single Kanban Board, you can organize different levels of the portfolio in multiple swim-lanes for tracking each Portfolio or each project/ activity within one Portfolio. So, depending on your comfort level handling multiple boards, and especially if you are using a physical Kanban board, you can choose to use a single or multiple Kanban boards to define your overall portfolio. Focus on Flow with Pull, WIP Limits and Explicit Policies:Organizations have limited resources; so they can take on a limited set of activities – be it projects or ad campaigns or recruitment drives. Thus at each stage of the project/ activity funnel, they can only have a limited number of those projects in order to optimally manage with their resources. It is therefore crucial that these projects, campaigns, and initiatives be done at optimal flow levels and completed so that additional activity can be undertaken across the enterprise. Flow is of paramount importance to use business-critical resources optimally and accomplish work based on senior management’s strategic priorities. Kanban, of course, provides a broad set of tools for managing and improving flow. Pull, WIP Limits and explicit policies serve as an ideal toolset to model organizational constraints, encourage managers and teams to complete projects at hand – and then take on more projects/ work! SwiftKanban provides you various powerful capabilities to set up and visually manage your portfolios. These include features such as Portfolio-type Swim Lanes, flexible, multi-board Card Hierarchy, automated progress-status roll-up based on user-configurable roll-up logic, visual indicators of progress at parent card level, and much more! Depending on your needs, you can model in several different ways. Learn all about SwiftKanban’s Portfolio Kanban features and see for yourself! To learn more about SwiftKanban, please take a look at the SwiftKanban features. Or, to give it a try, please signup for a 30-day Free Trial!